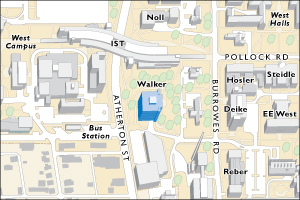 Students with Disabilities: The Office for Disability Services (ODS) Web site provides contact information for every Penn State campus: http://equity.psu.edu/ods/dcl. For further information, please visit the Office for Disability Services Web site: http://equity.psu.edu/ods. In order to receive consideration for reasonable accommodations, you must contact the appropriate disability services office at the campus where you are officially enrolled, participate in an intake interview, and provide documentation: http://equity.psu.edu/ods/guidelines. If the documentation supports your request for reasonable accommodations, your campus’s disability services office will provide you with an accommodation letter. Introductory Meteorology: A survey course about the atmosphere and the weather that it produces, with an emphasis on making you a savvy consumer of weather information. The dates and topics listed on the syllabus are only approximate. Changes will occur as the rhythm of the course becomes established. Some basic notes will be posted on Angel, but these notes will not represent all the material…consider them highlights. On many days, we will have a discussion of the current weather situation in which concepts covered during the course will be applied in “real life”. The tests and final will consist primarily of multiple choice, true/false and short answer questions and they are comprehensive in nature, although Exam II and the final will focus on material taught since the previous exam. Make-ups may be scheduled at the instructor's convenience for excused absences. The make-up should be taken before the scheduled exam time, if at all possible. To encourage reading of the assigned material and to emphasize the importance of class participation, note that quizzes compose a notable part of the final grade. Quizzes may be announced, but often will be a surprise. They will generally be multiple choice, true/false or short answer questions that deal with the recent material. Please be sure to bring a pencil or pen and some (preferably loose-leaf) paper to class, and don't be late! Quizzes cannot be made up but there will be a minimum of three drops allowed depending upon the final number of quizzes. Note also that the laboratory assignments are worth a quarter of your total grade. Lab assignments are due at the beginning of Friday’s class, with few exceptions! Again, if you are unable to attend because of an emergency, tell the TA as soon as possible and get the assignment- we cannot accept assignments once the next lab begins (a week late). Late assignments are penalized.